Have you ever lost the work of a full afternoon? Just finishing your afternoon long document and the electric power fails. You remember to save regularly, didn't you? Oops. 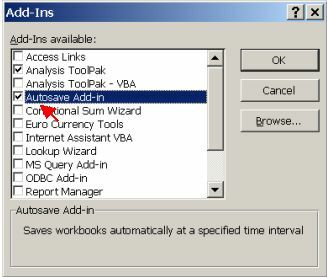 Learn how to make office automatically save your work every N minutes (you choose how many) in easy tip. Never loose your work again. 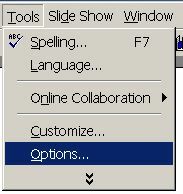 Works with Word, Excel and PowerPoint. Most Microsoft (R) Office application can automatically save recovery information that can be used to recover the file you were working when it failed. 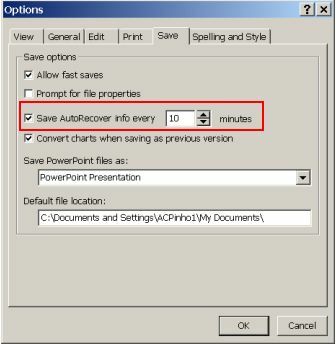 Regardless of the cause of the failure (power outage, computer freeze (commonly referred as "application crash") or any other) it will be possible to recover the document from the point of the last automatic save. 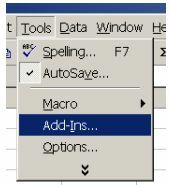 In this PC Tip, we will consider and illustrate how to do it for Word, Excel and PowerPoint. Other Office applications may also have this facility. Search for it on the application Help. 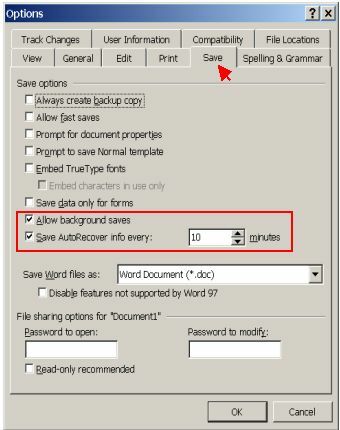 Autosaving is not similar to pressing the save button every X minutes. It won't save your file on your filename at the given interval. Instead, it will save Recovery Information on a specific file each time the interval limit is reached. How do you recover a document after a failure? Just open again the failed application and it should prompt you with the information that there is a recovery file to be used. You have to accept or deny opening it. If you accept, the file you were working will open, and you should save it to a regular file immediatly. Be careful: Autorecovery will only work the first time you open the failed application. If you don't recover and save the file data, it will be lost. Always open your failed application first thing after you reopen the PC after a failure and save the data to a regular office file. In case the recovery file doesn't appear when you reopen the failed application, you can open it as a regular file. The recovery file name is, according to Word 2000 Help file: "AutoRecovery save of file name.asd". 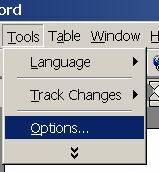 The default location is a system folder: "Windows\Profiles\username\Application Data\Microsoft\Word" folder where username is your login name on the PC. This folder is usually hidden, and it's not easy reaching it. Doing it is outside the scope of this PC TIP. Please refer to the Office Help file for more information (search for "Recovery Info"). You will be requested to enter the time interval between recovery info saves, in minutes. By default, the suggested interval is 10 minutes long, which is appropriate for most cases. Only in very specific cases it will be insufficient. You can recover from a 10 minutes loss, can you? If you're working on a normal size document, leave the default 10 minutes interval. On large documents, increase the interval to avoid a constant performance hit. Try a small increase to see if it is enough and enlarge again if it still impacts too much your regular work. Don't increase too much at once, because you're increasing your loss in case of failure. If you're working on an unstable machine (with a history of crashing) or on a sensitive file, with a huge number of changes, and the file size is manageable, the reduce it to what is viable without disrupting regular work. The rule is: leave it on the default 10 minutes setting unless you have a valid reason to change it, to either a larger or smaller interval. Excel is a complicated case. 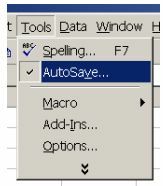 There is no standard option to AutoSave files. You need to install an Add-In that comes with the installation CD from Microsoft®. We will show how to install the add-in later, in case it's not already active. Can I know more about this subject ? Check our FREE PC Tips and Tutorials. They will be regularly published. Better still, subscribe our Email Newsletter. You will be informed when contents updates are made and automatically granted participation on any future promotion.